The invitations were mysterious, the theming a surprise and the prizes plentiful at ‘Outside the Box’ at the QEII Centre on 16 September. This spectacular showcase evening, held almost one year on from 2014’s rebrand launch party, was a celebration timed to wrap up the second phase of investments carried out this summer. Guests’ faces beamed as they entered part one of their immersive experience, a secret garden blooming with cherry blossom trees, rustic oak arches entwined with flowers and pretty lanterns. With grass underfoot and a panoramic view across the green to Westminster Abbey to enjoy, new-look exhibition space The Britten offered true escapism to the sounds of acoustic trio The Wandering Hands, who soon had guests dancing to renditions of feel-good hits. Further surprises awaited behind red curtains when a gregarious ringmaster appeared, beckoning the crowd into his pop-up circus filled with such retro memorabilia as a candy floss seller, head-in-the-hole cut-outs and strongman comedy act The Acrochaps, whose curly moustaches, leopard print leotards and impressive feats of strength had guests cheering. There was lots to see and do, with small plates crafted by QEII Taste and cocktails fuelling quiz antics via a specially commissioned mobile phone game designed by Marmalade on Toast. 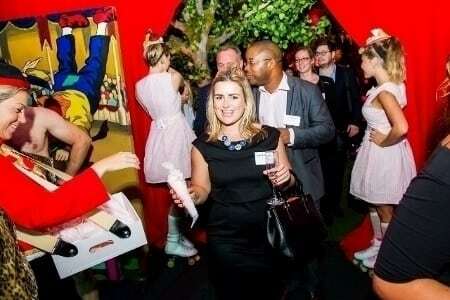 Played online, the interactive quiz required guests to search around the themed spaces and wider QEII Centre looking for clues in order to win prizes, which ranged from an iPad Air and lunch at The Clink Restaurant at HMP Brixton, to overnight stays, afternoon teas and dinners at partnering luxury hotels in central London. Beyond the circus was an American 1950s style drive-thru cinema complete with cheeky rollergirls, Mustangs, a screening of Grease and a buffet full of treats including mini hot dogs, mini burgers, rocky road cheesecakes, Baileys and Kahlua milkshakes and strawberry sundaes. Mark Taylor, chief executive, echoed this call to industry to enjoy the centre’s versatility: “We’ve listened to your feedback and have invested heavily over the last two and a half years in revolutionising the centre. This summer we’ve continued to build upon the major renovation works achieved last year. New wayfinding and digital signage, transformed spaces, luxury furniture, high specification lighting, AV and ICT technology, a new café lounge – all these things and more have been carefully considered to reinvent the way you access and utilise our centre. “Tonight is a celebration not only of our ongoing transformation, but also of our sensational industry. The grand finale came in the form of a balloon drop, three of which contained golden tickets to win an Apple Watch, a Kindle Fire HD and a signed Surrey County Cricket shirt. The QEII Centre transformed once again on 20 September, when Topshop Unique used the Britten to stage one of its biggest runway shows of London Fashion Week 2015.